Oakmont and Plum Borough Area. Being a caregiver of a loved one living with dementia can be a lonely and demanding job. That is why as a recognized Dementia Care Center of Excellence, Presbyterian SeniorCare Network developed Dementia360. The Dementia360 program is a comprehensive care management program that provides support and expertise to the caregiver in the surrounding Oakmont and Plum Borough area. It was designed to increase your ability to care for your loved one in the home – better and longer – while preparing you for the ongoing challenges of Alzheimer’s disease and related dementias. This helps avoid unnecessary emergency room visits and hospitalizations while also providing a better quality of life for the care recipient and caregiver. You are not alone. 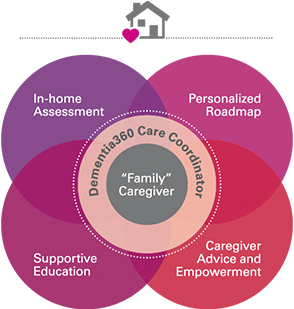 Your dedicated Dementia360 care coordinator is your link to a full circle of caregiver support. Based upon an in-home assessment, a personalized road map will be created to help identify both needs and opportunities. Your Dementia360 care coordinator will provide supportive education and connect you to other resources as needed. Studies have shown that “active management of Alzheimer’s and other dementias can improve quality of life for affected individuals and their caregivers.”* While caregivers report that caring for a loved one who has dementia is rewarding, many say they also experience higher levels of stress according to a long-term care survey by The Associated Press-NORC Center for Public Affairs Research. Through Dementia360, caregivers will receive the support, knowledge and resources to better manage the disease and related symptoms, which helps everyone involved in the journey. Please take a moment to fill out our form. A Dementia360 team member will follow up on your inquiry within the next few business days. Read more about Presbyterian SeniorCare Network and our recognition as a Dementia Care Center of Excellence and other credentials. 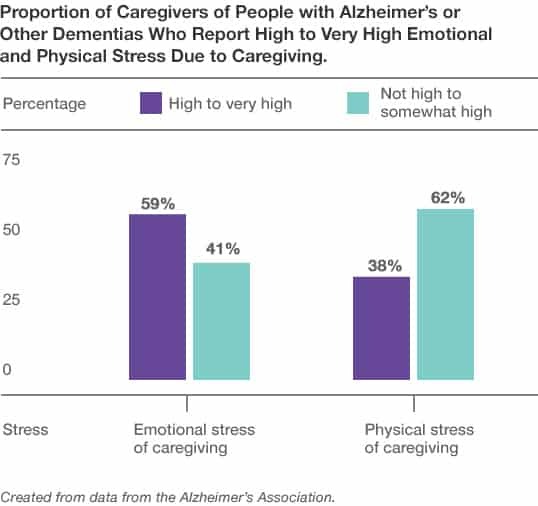 *2019 Alzheimer’s Disease Facts and Figures, Alzheimer’s Association, p. 11. Increased forgetfulness in day to day activity? Increased risk of safety, wandering, pacing or time at home alone? Changes in physical abilities, walking or ability to sit and stand? Struggles with communication? Difficulty getting food to the mouth, carrying out multi-step tasks such as buttoning buttons, getting dressed, choosing appropriate attire for the conditions, ordering food from the menu, etc? Is anyone else involved in helping you provide care? Share your time, talent and energy with people who truly appreciate your help. Work side by side with new friends who share your commitment to helping others. Inquire about volunteering below. We believe that collaboration and innovation are key to the seamless and cost-effective integration of services. If you have passion, commitment and are looking to truly make a difference with your next career move, then Presbyterian SeniorCare would like to talk with you about joining our award-winning team. At Presbyterian SeniorCare, jobs turn into long-term careers. Every day at Presbyterian SeniorCare, we demonstrate our vision to be your trusted resource for living and care options that meet your changing needs.